One of my beauty resolutions this year was to get on a more consistent schedule when it comes to washing my makeup brushes. I'm happy to say that I'm pretty proud of myself, and I've been washing my brushes about twice a week - although sometimes I let it go a bit longer. Washing your brushes is so important, as you don't want to be carrying bacteria over day after day. I use the baby shampoo method, as I find it to be the easiest! I bought the cheapest baby shampoo available, but you can use whatever brand you want. Baby shampoo is a lot gentler than regular shampoo, which means that it won't ruin your brushes. I only ever use synthetic bristles, so I can't comment on how to care for animal hair brushes. To start off, I get a little bowl and pour in some baby shampoo. I used to just add a drop of shampoo to each brush as I go, but I find this new method much more efficient. I take a dirty brush, run it under warm water, and then dip it into the baby shampoo. You don't need too much product to get your brush clean, but you do want to create a nice lather. I then take the brush and swirl it on the back of my hand. This creates a good lather, and you can see the product coming off of the brush. I then give the brush a good rinse in warm water, and gently remove any excess water. If you still see colour on your brush, repeat the process. I tend to wash all of my brushes at once, which means that I need a good drying area. I tend to take a towel and lay it down on any available surface. I lay down my brushes, making sure that brush heads aren't touching each other. I typically wash my brushes at night, and then let them dry all night long. By the time I wake up in the morning, my brushes are dry and ready to use! Make sure that you don't store your wet brushes standing up, as you don't want water getting into the handle. My boyfriend caught my cat Levi hanging out with my brushes! Naughty, but so, so cute! I too wash my brushes all at the same time lol, I use my facial cleanser for brushes that I used with cream/gel/liquid. With brushes I just use with powder, I use a normal liquid soap. It's just so much easier to do them all at once! Oh I would have thought that normal soap would dry out the bristles! Haha maybe your cat thinks they are toys for him? Haha! I have the brushes drying on the chair that he normally sits in... he must have gotten jealous! Good reminder, I need to wash my brushes. My formula is similar... it's baby shampoo plus a few drops of tea tree oil to condition and kill bacteria. That's genius to add tea tree oil! Does the tea tree scent linger on your brushes for long? I've always used MAC brush cleanser and I am almost on empty as of my Saturday cleaning routine, so I am curious about the baby shampoo (& now the tea tree oil too!). The cost would be much easier - which I love! Do the brushes come out soft? Thanks! Does that dry out your bristles at all? it's definitely a bonus knowing that the bacteria is completely gone! Heehee, I love the kitty shot. Very cute. I've used a few different soaps, but right now I'm trying out my H2O+ gel remover -- it's working surprisingly well! 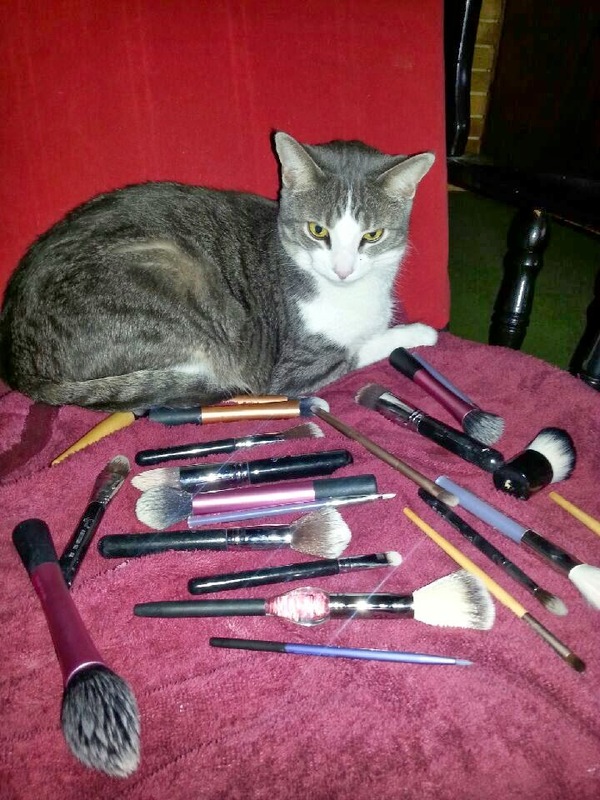 Your kitty is like,"Why are all these brushes on MY towel?!" I hate brush cleaning, but it's like laundry...it's gotta be done! I use the beautyblender cleanser, but I will take Kalyn's suggestion from before to use Fruits & Passion La Cucina ktichen soap! I know, I need to wash my brushes today and stop putting it off! How do you like the beautyblender cleanser, is it worth it to pick it up? I don't wash my brushes nearly often enough. I have an elf brush cleanser for when I do though. I really need to wash my brushes!it's been awhile…may go do it now… or tomorrow lol. Haha! Glad to have inspired you!